There’s a saying we’ve all heard from time to time. “A stitch in time saves nine”. That can literally be the case when any sort of accident happens, be it a snake bite, an injury, or flesh wound. A person with a prior condition, like heart attack, high pressure or diabetes might feel unwell, shortage of breath, or sugar spike. These can happen any time, into a road trip, in the house anywhere. This is where MFASCO’s First Aid Kit Emergency Response Trauma Bag Complete comes handy. 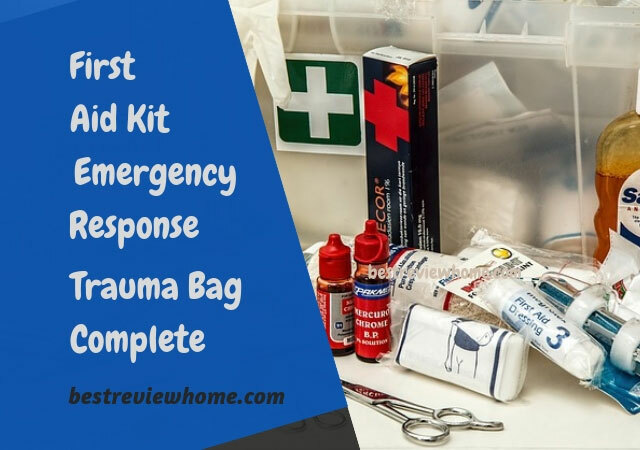 Why First Aid Emergency Kit? Nobody likes to think about accidents, let alone hear or read about it. Trust it, we’re not here to ruin your perfect day. But the sad reality is, when accidents happen, most of the time we’re not prepared. Sure, we might have bandages or antiseptics stored here and there, but no serious kit with everything in one place, well-organized. Even if we have a kit, a lot of times they aren’t upgraded and well equipped to can handle multiple injury types. First aid kit emergency isn’t something you can take chance with, especially if you have kids in the house. It should be armed with necessary things, of course. But you might also consider adding an insulin shot, guard, airbag, even a glow stick. On top of that, you should be aware of first aid emergency procedures. Nothing ever came wrong out of being careful, right? When it comes to First aid emergency kit, MFASCO’s First Aid Kit Emergency Response Trauma Bag is a clear winner. This is the best first aid kit for home you can get. Not only this bag contains a good number of components, it comes with an aesthetic design and reasonable weight. It’s easy to store in a cabinet, the back of the car, or your backpack if you’re going for a tour. Unlike most of the trauma bags out there, this one actually comes with a strong, well-made, easy to carry bag. The radiant plastic bag is very noticeable. The bag has two main compartments, two front pockets and two side pockets with zippers. This setup provides the opportunity to arrange the components in an easy-reaching manner. One thing you have scarce during an emergency is time, and this setup will help you get your necessary things quickly. The MFASCO emergency kit comes with a large number of items, 407 to be exact. You’ll find basic kits like bandages, gauge, pad, medicine, eye wash, saline solution, burn gel, ointment and others. They’ll come handy in cases of burns or wounds. You’ll get a stethoscope and cuff to measure blood pressure. It also has instant glucose if there’s any case of very low blood sugar. The bag comes in a dimension of 13" x 9" x 6". Containing over 400 pieces of kits, first aid emergency medicine, and supplements, this trauma bag weighs only 5.5 pounds. The bag is adjustable in a couple of different ways thanks to the side pockets. The shoulder straps the bag comes with, provide a nice means to carry it. Gauge pad of different sizes, cold packs, non-adhering pads, instant glucose, splinter outs, eyewash, saline eye and skin solution, penlight, emergency blanket, CPR pocket resuscitator, stethoscope, exam gloves, blood pressure cuff, antiseptic wipes, Iodine swabs, all types of bandage, Band-Aids of different types, dressings, burn gel, scissors, antibiotic ointment, alcohol pads, hand sanitizer and. first aid guide book. First of all, the package. 407 items organized in a medium sized bag, not bulky, not a hassle to carry with. The price this bag comes in features the lowest cost-per-item on the market. This bag is a savior in common injuries like wounds, bruises or burn. Patients with diabetes and heart condition can also be benefited as well. The package comes with a first aid guide book. Additional kits like the stethoscope, cuff, penlight, CPR mask. Not too much we can think of. Unless you think of your hamburgers as an emergency kit, this bag covered pretty much everything. Adding tourniquet or EMT sheers would be a good upgrade though. Emergency first aid kits vary in sizes and purpose. There are sports types, outdoor or traveling types. They usually cover a certain type of components. If you are not looking for any specific type, using an all-purpose trauma bag is the best idea. Users were very satisfied with the performance of MFASCO’s First Aid Kit Emergency Response Trauma Bag. An impressive rating given by hundreds of people doesn’t say wrong. There are many products on the market claiming to be all-purpose, but we found a very few to be worthy of calling that, and this one was the best of them.